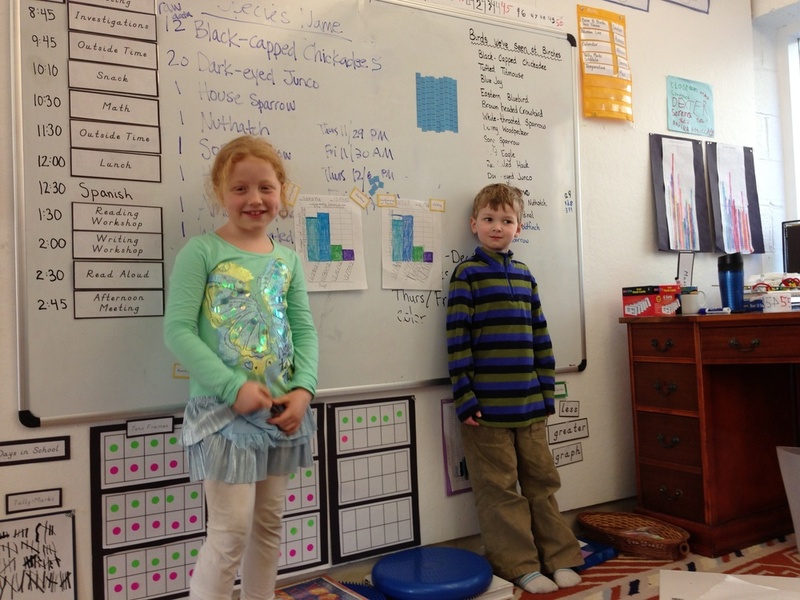 Birches students present their bar graphs showing data collected after our first two weeks of Project FeederWatch. This Second Grader and Kindergartner worked together to show the number of Dark-Eyed Juncos that visited our three feeders over four days. The Juncos are one of ten different species of birds that we have seen at Birches over the past few weeks. As participants in Project FeederWatch, students observe the feeders outside of our classroom window for 15 minutes on two consecutive days each week and record the species and number of birds that visit. This data is sent to researchers in the Lab of Ornithology at Cornell University who track trends and movements of winter bird populations. The students love being "citizen scientists," helping these researchers with the project. They take their job seriously and their observation skills and attention to detail are improving markedly each week!